As part of the larger trend towards "securitization" of citizenship, citizenship deprivation in Canada is becoming increasingly normalized, resulting in some cases in statelessness. In this article, I pursue a sociology of statelessness by examining its localized production and connections to a broader network of social and material relations. I do this through a case study of Canadian-born Deepan Budlakoti, who at age 22 was informed that he was in fact not Canadian, and lacking any other citizenship, was rendered stateless. Actor-Network Theory is employed to trace how it is that legal documental and heterogeneous networks of humans and things (e.g., a "legal technicality") have been enrolled to produce a legal decision declaring that Budlakoti, despite his Canadian birth certificate and passports, was never a Canadian citizen. Yet because he has not exhausted all avenues to acquisition of some citizenship (e.g., in India or Canada), he also has failed to secure recognition of his statelessness. 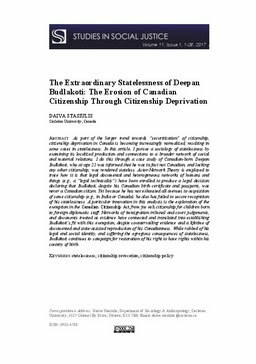 A particular innovation in this analysis is the exploration of the exemption in the Canadian Citizenship Act from jus soli citizenship for children born to foreign diplomatic staff. Networks of immigration tribunal and court judgements, and documents treated as evidence have connected and translated into establishing Budlakoti's fit with this exemption, despite countervailing evidence and a lifetime of documented and state-assisted reproduction of his Canadianness. While robbed of his legal and social identity, and suffering the egregious consequences of statelessness, Budlakoti continues to campaign for restoration of his right to have rights within his country of birth.